Economical, impressive Exit Signs offer remote capability to meet fast-changing local and regional codes. 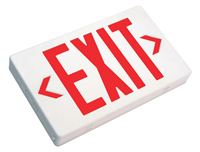 Choose the best value in Exit Sign LED technology. • The LED lamps have a 25-year or more lifespan. • This is a Standard AC unit, but emergency battery units are available. • Comes with an EZ-snap mounting canopy to display your sign flag mount off a wall or drop down from a ceiling. Mounting unit is 5/8" by 4 7/8". • Need emergency battery backup? Check off the "Battery Backup" icon below and add a battery for just $5.00! Great sign. Clean and easy install.